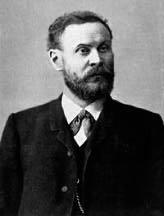 If Cayley is aviation's grandfather, Otto Lilienthal is its uncle. From statements and writings left by the Wright brothers, it is clear Lilienthal was an important source of inspiration for their efforts. 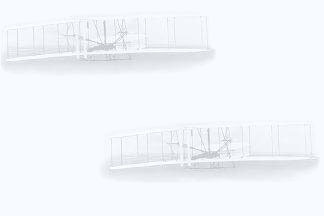 A case can be made that the writings of Lilienthal directly inspired the Wrights to take on the invention of the airplane as an interesting pursuit. Certainly their early framing of the "problem of flight" was derived largely from Lilienthal's ideas and difficulties. Echoes from Lilienthal's article Practical Experiments for the Development of Human Flight are clearly evident in Wilbur's address to the Western Society of Engineers, and in his first letter to Octave Chanute. Before 1881, attempts to develop airplanes and gliders were occasional and sporadic. Lilienthal changed all that. Indeed, Lilienthal's efforts broke the 'respectability barrier' that haunted serious efforts to develop airplanes. Before Lilienthal, building a heavier-than-air craft was widely considered to be the province of dreamers and fools; afterwords it seemed possible to fly. Thus, his efforts mark the beginning of the experimental period of active research on heavier-than-air flight. 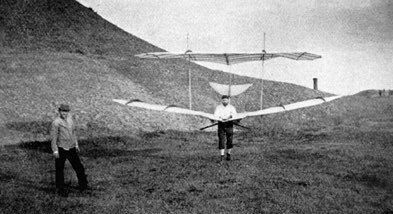 Lilienthal developed eighteen different models of his gliders over a span of 5 years. His efforts received worldwide publicity, and his successes lent others the courage to follow in his footsteps. Fifteen of Lilienthal's gliders were monoplanes, three were biplanes. Each model was a hang glider, controlled by the pilot shifting his weight rather than through the use of any active control surfaces. These eighteen craft will be described separately at some point in the hopefully-not-too-distant future. Sir Charles Gibbs-Smith divided airplane inventors into two categories. The first he termed "Chauffeurs of the Air," because they acted as though flying a plane was like driving a car. Maxim is the best example of this large category. In contrast, Gibbs-Smith identified "Airmen" who understood that the fluid medium of air made flight a quite different proposition than land-based maneuvering. Chauffeurs tended to be concerned with obtaining sufficient propulsion, without worrying overmuch about factors like lift or control. Airmen often worked on gliders before tackling the problem of powered flight. Lilienthal is the prototype "Airman." Lilienthal's first glider was tailless, little more than a pair of wings. He tested this glider by jumping off a board. Lilienthal's experiments were soon to get more serious, however. He built an artificial conical hill (visible in the background) at Lichterfelde, near Berlin, so he could launch his gliders into the wind no matter which direction it was coming from. No. 11 was the 'standard' Lilienthal model, a monoplane with a wing area of 13 sq. m. At least eight replicas of this model were built, and either sold or presented to clients. The National Space and Air Museum in the Smithsonian has a No. 11 built by Lilienthal. Lilienthal is the source of two famous quotes about inventing airplanes. The first illustrates the discipline that must accompany creativity in invention: "To invent an airplane is nothing. To build one is something. But to fly is everything." The second was all too prophetic: "Sacrifices must be made." He died August 10, 1896 from injuries sustained two days earlier in a crash of one of his hang gliders. Lilienthal's portrait was copied from one of the Aeronautical Annuals published by James Means around the turn of the century. The images of the biplane glider derive from the same source.